Thinking about something a bit bigger for waves. Guys usually quote front wing sizes in cm. Does anyone know how many cm the double agent would be so I can use as a compassion to a SUP foil? I'm a lazy kiter and have found the kite I normally on SB just does me fine on a foil. You guys that use smaller kites. I understand that you have to work the kite more to get going. Are you always having to sign it to keep going or once your up you can park it? Kite foilers do not get much lazier than me, smaller the kite the better but 27m lines. My favorite kites are 4.8, 6.2 & 8m Clouds. When 8kn I use a 10.4m Cloud but over 10k the 8 is good. Once up on the foil apparent wind comes in so not a lot of working the kite required. How do you measure the size of a wing. Is it as easy as measuring around the outside edge? high as a kite said.. Some use area, some use span tip to tip. The double agent looks roughly like two trangles joined on an edge. I would measure the widest point of the wings (width) x nose to rear (length) / 2 (and then 10 to 20% for the curves). I expect it will be between 600 and 700cm2. Of course, there is a lot more to it than size (surface area). 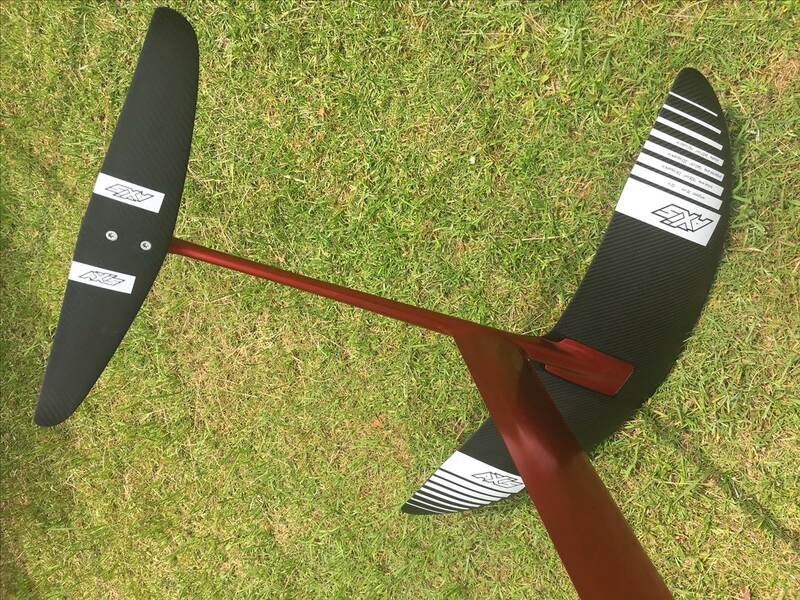 Aspect ratio, wing thickness and camber all greatly affect lift, glide, maneuverability and speed. Having said that, most SUP wings will have a TON more lift than your Double Agent, you just can't quantify it by comparing surface areas. If you want to ride bigger waves powered with the same as an kite as you would an sb then dont get a sup wing. You will be overpowered in nio time. Further to this if you want to piddle around in small waves slowly then yes sup wing. For real manly waves NO! the sup wing will be way too slow for the wave. Look at mid aspect foils that can handle the speed of a bigger faster wave. That is correct they certainly do power up on a wave but up to a certain size with the right gear what a lot of fun. You get to learn to surf on the foil with little kite input and the stability with controllable speed is great for progression. They also recover from breaching well. I have used slingshots H2 and H4 extensively this summer gone. I have a new toy. It's for paddle in foiling. Like you; I have a cabrinha double agent. I never realised how easy this was for learning until riding other foils. I got up straight away on the cabrinha and could turn both ways within a couple of sessions. (I don't switch stance). What makes the cabrinha easy is it's like a sea anchor that sits on its side. 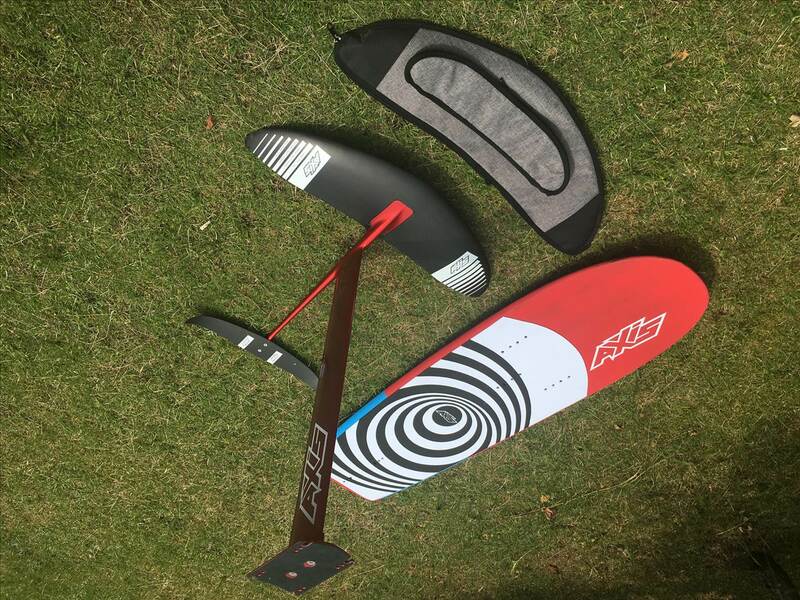 The foil and board combo has the right amount of float and weight and low speed take off to make it simple. You can also pick up swells with the kite. I to; was riding a kite similar size to a surfboard. Maybe 1 or 2m down at most. The new go foil, jimmy Lewis 5'4" combo is completely different. It is super light. It will blow away and a white wash will take it all the way to the beach. (Both the foil and board are super Bouyant) The foil requires way way less kite. In fact no kite. I thought I would get up ok first time paddling. Not so. It's way way harder than kiting a foil. The foil was rising as I was standing up and I struggled to get enough weight forward quickly. This set up really does fly, but I am at an infancy stage with it. Blue bottles and being overpowered cut my first kite session on it short yesterday. Will know more with time. I have friends with the naish surf foil. They are Frankensteining them to surfboards to paddle in and kite. The rides they are getting are incredible (which got me into it) Although heavy they work. For me atm my set feels too light... like I need to insert lead into board; like we used to in tow boards. I'm hoping I master it and it becomes an advantage. With the Tuttle box and single screw of go foil I have not way of adjusting mast position or shim of foil for learning. Something in there may help you! Now you got me worried ??!!! coming next week, sounds like I will struggle on it even more.....??? Your Moses will be much easier. Don't worry!!! Don't worry. I was up and riding yesterday. The foil has incredible glide and needs virtually no kite. Felt like a different sport to foil kiting. The cabrinha needs a constant pull. The go foil picks up virtually any swell and runs. It turns smoothly. The hard part I was talking about is the paddle in to stand up. Would be way easier SUP cos your already standing. 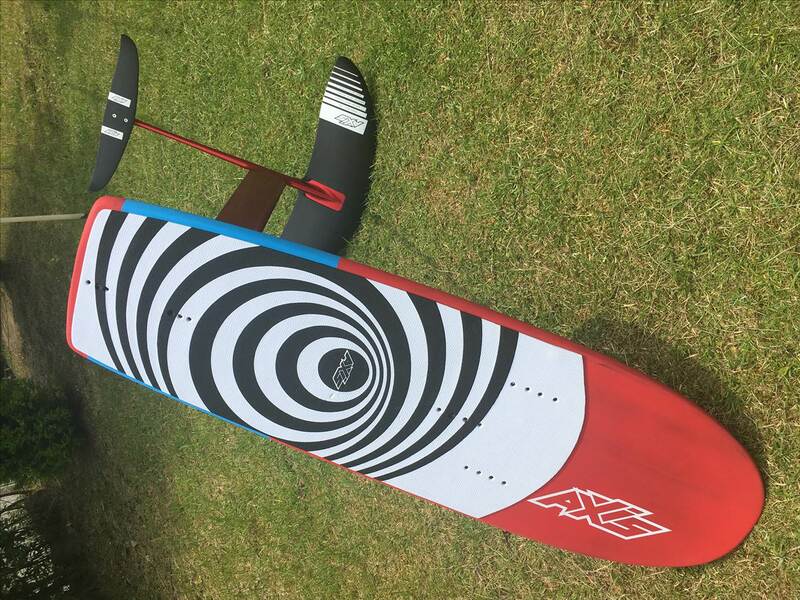 Also the strapless deep water start kiting; with a super light board that blows and moves the second you foot touches it. I ended up doing similar to a jump on when you beach start on a surfboard; except from a laying position. Fun when up and riding except a screaming hum. Any tips on the procedure to get rid of it appreciated. Have not done it myself but read in a post that someone tried it and it worked. 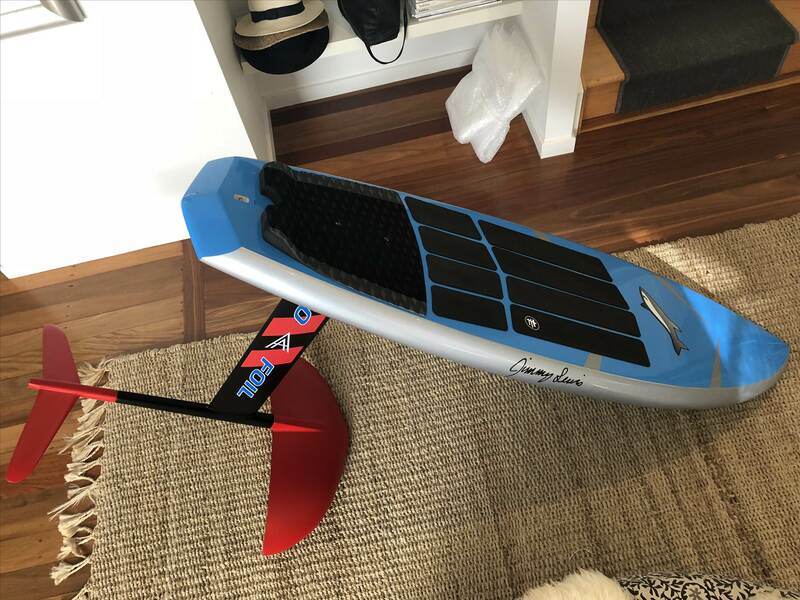 Hi, I would like to start foiling in flat water and (paddle) surf small waves, is there a do-it-all foil out there? what about Cabrinha double agent with 60cm mast?thanks in advance! can't help with the humming but it just may be a light sand on the wing that could fix it. As far as light boards and light wind launching I did a little vid I posted here a while ago on how to get up on the foil strapless and be flying on the wing in ones easy downloop. Not sure how far back it is on this forum but it might help. I kite on a Naish medium surf foil. It's designed to be used for surfing and SUP. Limited top speed but easy to learn on. The reason I bought the Naish was the whole system is modular and interchangeable. There are kite wings and surf/sup wings and all fit on the same fuselage. There are three different mast lengths for the different stages of learning. For what you want i highly recommend the L or M (dependiong on your weight) Naish surf setups. They come stock with a 55cm mast. I know fanatic/North have something similar going on in terms of interchangability, but speaking with the local dealer they said they were having a few issues with them. To measure the flat area, divide the wing into a series of rectangles from front to back. If it's a kite usually the panels give you a good enough set of rectangles to work with. For a foil, put some tape on it and mark a line every few cm. You only need to do it for half the wing. Measure the width and the depth at the middle of the rectangle. That compensates for the angle or irregularities of the trailing or leading edge. It also works for triangular tips. Calculate the area of each rectangle. Depth x Width. Add them up and double it (because you only measured half the wing). You can't measure the projected area but you can estimate it. Most kites are around 60% of the flat area. PS My go to foil for all kinds of fun is the J Shapes Cruzer. Great in the waves or slashing around on flat water. I must live in a different universe. i go down for a kitefoil in some waves and those waves never shape up and smooth out and peel away like in the videos. maybe once or twice a year, but for 99% of the time the faces are lumpy and testing every cm of my 90cm mast. getting back out on the foil is a roller coaster ride treading between board slaps and that fun gurgling sound of a wing vent. Since you want a foil for learning to kite and to surf, I would get a big SUP foil. They are relatively easy to learn on (slow, stable) for kiting and also (obviously) designed for SUP foiling. The big Naish foils, Liquid Force Impulse or Moses 633 are some examples. The Cab DA will be very difficult to paddle surf unless your initials are KL. CJ2478 my plan was to get a Naish foil but apparently stocks are quite scarce here where I live so I've ended up with a Cab DA, 60cm mast. I'll use a 5'6''x19'' Appletree surfboard instead of the cabrinha one, extra volume should help me with take off when surfing. May be switching the front wing with a bigger one...Thanks for the advices! finally was able to get a Naish surf foil with large wing. I'll get a medium one as well. Can't wait to try it out! Why would you buy a medium as well? Am struggling to decide what surf foil to buy (before I try). Am a surfer 1st, then kiter (as Sydney crowds grew and my paddle fitness shrank). Am hoping to play in waves and swell and worry that a 60cm mast is too short for playing in choppy swells. thanks in advance for advice for a tall 100kg surfer who wants to catch more waves. The 70cm masts for Spitfire XXLW will be back in stock end of this month. The Spitfire XXLW has an wing area of about 1300cm2 but due to both wings lifting and not having one pushing down, they provide about 30% more lift. So compare that 1300 to a normal foil with say 1690cm2. There's more to it of course but it's a rough guide. With that thickness and the "lightweight"claim, I call the "full carbon" statement BS. I bet it is a foam core with little carbon on it.